Very often, in qualitative discussions of molecular orbital theory, approximations are made to greatly simplify the view of the molecule. Information is lost whenever we approximate, so this is not as good as a more careful approach. However, there are cases in which we want to focus on one aspect of the molecule and don't want a complicated picture to distract from that focus. This structure requires that the carbon form bonds with hydrogens arranged in three dimensions around it. An s orbital could do this easily, because it is symmetric in all directions and can overlap with neighbours in any direction. In order to bond with hydrogens in three dimensions, all three p orbitals will be required, since together their axes define three dimensional space. In an approximate approach, we don't worry about the specific interactions between specific pairs of orbitals. We simply say that the carbon 2s and 2p orbitals will all act together to bond with the four neighbouring hydrogens. The result is four bonding orbitals and four antibonding orbitals. We don't worry about the relative energies of the four bonding orbitals; we assume they are all similar. This result is not consistent with photoelectron spectroscopy. Our more rigorous approach to methane is more consistent with experimental data. However, this shortcut, which is sometimes referred to as a "hybridization" approach, is often used to discuss more complicated molecules. A tetrahedral atom can use an s orbital and three p orbitals to bond with its neighbours. When using a hybridization model, a tetrahedral atom. It is sometimes referred to by the label "sp3 hybrid". Suppose you wanted to use a hybridization approach to show a rough molecular orbital diagram for borane, BH3. a) What is the expected geometry at boron in borane? b) Could the s orbital bond with the hydrogens? c) Given the geometry of boron, could all of the p orbitals bond with the hydrogens? d) Are any orbitals not properly oriented to bond with the hydrogens? If so, they would be non-bonding and would not go up or down in energy upon formation of the molecule. 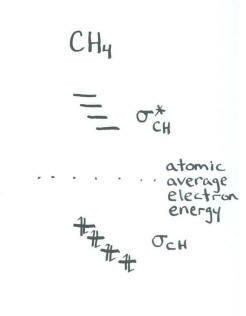 e) Show the resulting molecular orbital energy level diagram for borane. f) Tetrahedral atoms are referred to as sp3. What hybrid label would you give your boron with this geometry? Suppose you wanted to use a hybridization approach to show a rough molecular orbital diagram for beryllium hydride, BeH2. a) What is the expected geometry at beryllium? c) Given the geometry of beryllium, could all of the p orbitals bond with the hydrogens? e) Show the resulting molecular orbital energy level diagram for beryllium hydride. f) Tetrahedral atoms are referred to as sp3. What hybrid label would you give your beryllium with this geometry? 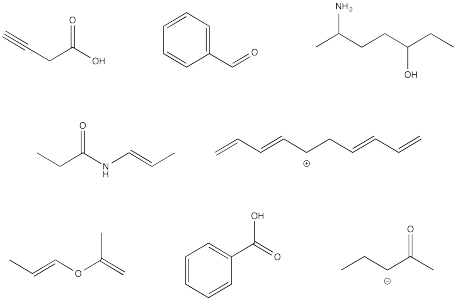 Indicate hybridization of each carbon atom in the following molecules.